Benromach Hermitage 45% Abv. Distilled 2005, bottled 2015. First fill bourbon casks for 8 years, then finished for 18 months in wine casks from the Hermitage Appellation D’origine Controlee. Friday 6 November 2015. 12.15 pm. It’s a damp, grey, watery overcast day, but, not cold. I don’t have the fire on in the house, and, am sitting at my desk looking out over Loch Indaal, Islay. I’ve got the kitchen window open and lots of candles lit. The label is olivey green with a thin gold border. A very contemporary, ‘casual’ personal style. 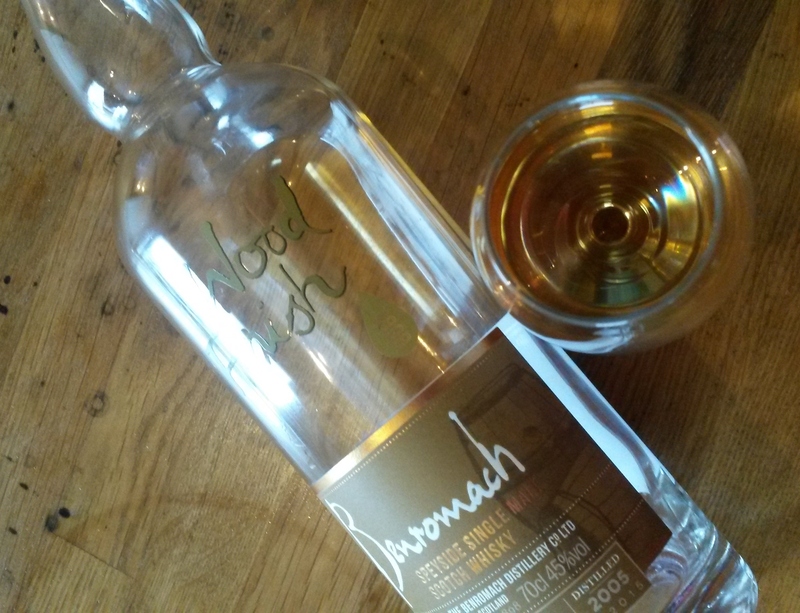 The writing saying ‘Benromach’, and the the writing on the glass of the bottle saying ‘wood finish’ are in an intimate ‘hand written’ font. This implies a personal, hand crafted ~ only a few of a kind ~ feeling about this dram. A trendy exclusivity. The colours are ‘day time study’. So, not too luxurious… , not dauntingly expensive or overachieved. A young demographic with aspirations. The label will remind them of dad’s success, or someone older’s success. Think beginners’ luxury; at lunchtime! Not a scarey dram. A very approachable bottle; designed for men. Colour: Pale, pinky gold. Like the rose gold band of a Russian wedding ring. Very viscous. Great band of gold around the top of the dram, very similar to a Bruichladdich. Very oiley, creamy looking, remnds me of a Jura. Not the standard expressions, but some of the different, older ones. Jura has a lot of ‘pinky’ colours in their drams too. Very thin, tight legs. This dram is a full bodied 9 1/2 YO. First nose: Fruits, a hint, just a hint of Christmas cake. Green leaves on roses. Sultanas, sulphur, watery, salty. Whiff of something very earthy and chthonic, sardines, cats. Cats…??! Lovely colour when you look down into the glass. It twinkles rose gold. Hardly makes a sound when you swirl it in the glass, it is so viscous. When it does make a sound it tinkles like crystal glasses chinking. Second nose: Musty, straw, stables, in the middle of the journey of the dram. Something metallic and soft going to roses and rose bushes coming in from the left. This style of nose reminds me greatly of some Jura drams. On the top is a shortbread layer, warm and kind. Palate: Musky, creamy. Very silky mouthfeel of the liquid. Dry, dry feeling left at the front of your mouth from the tannins. Very soft and fluffy at the top of the throat, when swallowed. The finish is not that long. Sweet and cheerful in the chest. This thing in the middle gives it power and strength. So could you say briney, and cereal and vanilla instead? Very dry in the mouth from the tannins. A bit woody. With water: much more salty, fishy grassy, dark woody. Loses its voluptuousness. Better for me without water, but take a glass of water on the side. I like this dram. It is a strange dram. I would buy it in the bar to share with friends. Both Benromach and Jura have semi lauter mash tuns, which tend to give cloudy worts which can make a malty or nutty or creamy or oily (depends on your word) aspect to the dram. The casks used here are probably red wine from the Syrah grape, which is what gives the fruits and Christmas cake nose at the start. Lots going on here. Silky mouthfeel from the creaminess, but an astringent aspect from the red wine tannins. A busy, interesting, accessible dram! Thanks to Andrew Rouse for sharing.